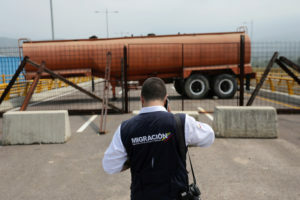 CUCUTA, Colombia — The Venezuelan military has barricaded a bridge at a key border crossing, issuing a challenge on Wednesday to a U.S.-backed effort by the opposition to bring humanitarian aid into the troubled nation. The squabble is now the latest front in the battle between Guaido and President Nicolas Maduro, who is vowing not to let the supplies enter the country. Maduro argues Venezuela isn’t a nation of “beggars” and has long rejected receiving humanitarian assistance, equating it to a foreign intervention. Guaido says the emergency shipment is a “test” for Venezuela’s armed forces, which will have to choose if they allow the much needed aid to pass, or if they instead obey orders. Colombia shares a 1,370-mile border with Venezuela and is backing Guaido. The neighboring Andean nation has received over one million Venezuelan migrants in the last three years. Associated Press writer Scott Smith contributed from Caracas, Venezuela. AP writer Luis Alonso contributed to this report from Washington.